ROPAR, Feb 10  The district administration has started making arrangements for the Hola Mohalla celebrations of Kiratpur Sahib and Anandpur Sahib. NAWANSHAHR, Feb 10  The Punjab Kisan Sabha as resolved to launch "karza mukti morcha" from February 16 to 26 in the state. CHANDIGARH, Feb 10  The Rs 1,000 crore sugar industry in Punjab is in a crisis due to several reasons, the principal one being shortage of raw material to feed it for a full season of 180 days starting November 15. FATEHGARH SAHIB, Feb 10  Many buses and trucks here went off road today due to apprehension among people that the District Transport Officer might impound their vehicles for sending people to the Akali conference to be held in Patiala on February 12. BATHINDA, Feb 10  In a case of extra-marital affairs Paramjit Kaur hatched a conspiracy with her daughter Kamalpal Kaur and her (Kamalpal Kaur) boyfriend Charanveer Singh and murdered Ravinder Pal Kaur, wife of Punjab police Head Constable, Paramjit Singh, with whom she was allegedly having illicit relations. FEROZEPORE: Residents of Shanti Nagar, a locality here, have been facing many hardships due to lack of basic civic amenities, including water supply and sewerage. LUDHIANA, Feb 10  The 100th birth anniversary of the first Akali Chief Minister of Punjab, late Justice Gurnam Singh, will be celebrated here on February 25. 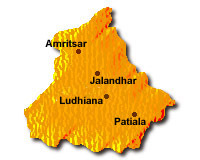 PATHANKOT, Feb 10  The Punjab Government is considering to revive sales tax barriers in the state. Mr Tejvir Singh, Additional Deputy Commissioner, Anandpur Sahib, has been appointed mela officer while Mr Gurmit Singh, SP, has been made nodal officer to maintain law and order in the mela areas. As many as 14 control rooms will be set up in the mela area to coordinate with officers of various departments and exchange information. Each control room will have police force, first-aid assistance or dispensary. During the mela, period an officer from each department will remain available round the clock in the office of the mela officer at the tehsil complex at Anandpur Sahib. The heads of various important department will be provided with wireless sets to meet with any emergency. Special arrangements have been made for plying special trains and buses. Besides this, alternative routes have also been arranged for the mela vehicles. The electricity and water supply departments have been directed to ensure the supply of uninterrupted power and water supply during the mela days. The municipal authorities have been asked to recruit temporary 'safai sewaks' to keep the mela area clean. As many as 4000 temporary toilets will also be set up. The District Food and Supplies Controller has been directed to ensure the supply of essential commodities. The arrangements were chalked out and discussed at a meeting held under the presidentship of Deputy Commissioner K.S. Sidhu at Anandpur Sahib, yesterday. NAWANSHAHR, Feb 10  The Punjab Kisan Sabha as resolved to launch "karza mukti morcha" from February 16 to 26 in the state. Sabha members will gherao the offices of Deputy Commissioners and court arrests in the first phase of the agitation. This resolution was adopted after an intensive discussion on the deteriorating condition of farmers in the state during the three-day-long 33rd state-level delegate conference of the sabha, which concluded here today. The conference was dedicated to the memory of Sardar Ajit Singh, who had launched the first ever organised peasant's movement in India during the pre-Independence era. The delegate conference was inaugurated on Monday by the CPM general secretary, Mr Harkishen Singh Surjeet. As many as 450 delegates from all over the state took part. At least 35 delegates took part in the discussion and resolutions were passed unanimously. The sabha expressed its grave concern over the present condition of the farmers who under the burden of debt had been committing suicides. The government had been doing nothing to ameliorate their sufferings. The sabha held the wrong policies of the governments both at the Centre and the state responsible for the prevailing situation. Later, addressing a press conference, Mr Lehmber Singh Tagger, general secretary of the sabha, said the sabha had chalked out a programme to gherao the offices of Deputy Commissioners as per the following programme  February 15 at Sangrur, February 16 at Amritsar, February 17 at Ropar and Ferozepore, February 18 at Gurdaspur, February 19 at Faridkot, Mansa and Bathinda, February 22 at Ludhiana, February 23 at Jalandhar, February 24 at Hoshiarpur, February 25 at Patiala and February 26 at Nawanshahr. The sabha has decided to raise the demands which include waiving of all types of loans of farmers and agricultural labourers, advancing loans to farmers at 4 per cent rate of interest per annum, granting Rs 5 lakh as compensation to kin of those farmers who had committed suicides ensuring implementation of the crop insurance scheme, enacting a law to provide compensation to the farmers for their damaged crops due to natural calamities, setting up agro-based industries and ensuring supply of standard pesticides, seeds and fertilisers. The election of the sabha was also held on the occasion. Mr Rachpal Singh and Mr Tagger were re-elected president and secretary of the sabha. Besides, a 45-member working committee, including an 11-member executive, was also elected. As many as 35 state delegates were also elected to take part in the All-India Kisan Sabha's 29th delegate conference scheduled to be held at Calicut from March 5 to 8, informed Mr Tagger. Mr S.R. Pillay, an MP from Kerala and general secretary of the All-India Kisan Sabha, while talking to mediapersons, said the state-level delegate conferences were being organised in preparation for the all-India conference. So far, eight such conferences had been organised and this process would be completed in February itself. He said the sabha was the oldest and largest peasant organisation having 1.88 crore members in the country. After the national-level delegate conference a countrywide stir would be launched to oppose the wrong government policies both at the Centre and the state level. The sabha was of the opinion that policies being pursued under the influence of globalisation, GATT, WTO etc were disadvantageous to peasants and agriculture in the country. Under the influence of these policies, the government had been reducing public investment in irrigation, power, scientific research and technology, shrinking credit facilities to the farmers forcing them to fall in the debt trap of money-lenders. Moreover, the government under the patent law had been granting the rights of marketing of a number of crops, animals, plants etc to multinationals. The government had not been taking any action against the companies which had been supplying spurious seeds, pesticides and fertilisers to the farmers. These had been damaging the crops and ruining the farmers, he alleged. He said the sabha would launch a countrywide stir to press the government not to pass this legislation, protect the interests of the peasants and ensure crop insurance scheme and minimum support price of crops. Already eight sugar mills  Rakhra, Zira, Jagraon, Tarn Taran, Faridkot, Ajnala, Budhewal and Dhuri  have closed their cane crushing operations as these did not get adequate cane for continuing their operations till April 15. This season, the Jagraon mill remained operational only for 29 days and Rakhra for 25 days. Zira and Tarn Taran crushed cane for 45 and 40 days. The Faridkot and Ajnala mills got the cane supply for 55 days. There are 22 mills in the state  15 in the cooperative sector and seven in the private sector. One cooperative mill at Budhlada is under liquidation. For feeding the mills for a full season at least 800 lakh quintals cane is required, while this year cane available to industry for crushing will not cross the figure of 300 lakh quintals. Sugar yield is expected to be an all-time low in the state this year while it will touch a record figure in the country. According to industry estimates, it will not cross the figure of 2.5 lakh tonnes while last year's figure was 3.31 lakh tonnes. The best period for cane industry has remained 1994-95 when sugar yield had jumped to 6.33 lakh tonnes and next year was also good when yield was recorded 6.13 lakh tonnes. Falling sugar recovery and cane yield per hectare has become industry's bane. According to Mr M.P. Singh, Managing Director of Sugarfed, this year sugar recovery will be around 8.40 which is slightly lower than last year. Even states like Haryana and UP have recorded lower sugar recovery. Adverse weather conditions in November, December and January are blamed for poor sugar recovery as well as cane yield. States like Maharashtra, Gujarat and Karnataka have never recorded sugar recovery less than 10 per cent while Punjab has never touched a figure of 9 per cent. Less sugar recovery means less production of sugar. Nine per cent recovery means nine bags of sugar from 100 quintals of cane. If recovery is 10 per cent it means 10 bags of sugar from 100 quintals of cane. The other major problem of mills is linked with sugar price. Out of total sugar produced by mills 40 per cent had to be given to the Central Government for levy quota and remaining 60 per cent mills are permitted to sell in the open market. At present levy sugar is procured for mills at the rate of Rs 1044 per quintal by the government and mills get about Rs 1,425 per quintal for sugar sold in the open market. On an average they get Rs 1,260 per quintal by clubbing both levy and open quota sugar. But Mr M.P. Singh says that the average cost of preparing a quintal of sugar in the mill is around Rs 1450. This means for every quintal produced by mills, they suffer a loss of Rs 200 per quintal. Some part of this loss is offset by selling molasses in the open market to distilleries at a market rate. Though it is a mandatory for mills to give it to distilleries in the state. In existing circumstances, there is no way out but to suffer a loss for mills. According to informed official sources, the operational loss of the mills this year may go beyond Rs 50 crore. Only those mills will be less affected which have a free-sale period. A newly installed mill is allowed a period of 10 years of free sale and levy quota is not charged from such mills. FATEHGARH SAHIB, Feb 10  Many buses and trucks here went off road today due to apprehension among people that the District Transport Officer (DTO) might impound their vehicles for sending people to the Akali conference to be held in Patiala on February 12. Capt Kanwaljit Singh, Minister for Finance, had yesterday took part in a meeting of Akali workers at Bachat Bhawan, which was also attended by district officials, in preparation for the conference. Even the Deputy Commissioner of Patiala visited the district today in this connection. It is believed that the organisers are heavily depending upon Fatehgarh Sahib for the meeting as the place is considered to be a stronghold of Mr Tohra. Mr Balwant Singh Sahpur, MLA, Amloh, who recently switched his loyalties from the Tohra camp to the Badal camp, said that about 300 vehicles, including buses, trucks and trolleys would be taken to the conference. He said 150 vehicles would carry people from Amloh constituency for the conference. Mr Ranbir Singh Cheema, a former minister, said he would be taking a fleet of nearly 100 vehicles in this rally. He said he had toured the entire Sirhind constituency and the people wanted to show that they were with Mr Badal and Fatehgarh Sahib was not a stronghold of Mr Tohra. Jathedar Sarwan Singh Suhavi said he had demanded 100 vehicles from Khumanon circle, although only 50 had been allotted to him. Sources revealed that a large number of employees belonging to the Punjab State Karmchari Dal are expected to take part in the conference. A Tohra loyalist said that on the one hand, the government had directed all DTOs to collect maximum revenue through challans, while on the other hand, it had directed them to impound vehicles for the rally. He said there was no use of forced gathering and that it would be a "sarkari show". The people of the area are with Mr Tohra, he said and only a few people would go from the district as they had rejected the "traitors". Paramjit Kaur, who wanted to kill Ravinder Kaur, as the latter was opposed to her affair with Paramjit Singh exploited the relations of her daughter Kamalpal Kaur with Charanveer Singh and killed Ravinder Pal Kaur on January 27, 1999 in the police colony by administrating some poison to her. Mr Jarnail Singh, District Inspector, Punjab police who is investigating the case, told TNS that Paramjit Kaur, Kamalpal Kaur and Charanveer Singh son of Mr Harpal Singh, ASI, were involved in the murder of Ravinder Pal Kaur on January 27. Mr Jarnail Singh said, Paramjit Kaur was questioned and she confessed having illicit relations with Paramjit Singh, husband of the deceased. She said she asked her daughter to motivate her boyfriend Charanveer Singh to help them in the murder of Ravinder Pal Kaur. The three were arrested yesterday, he added. Mr Jarnail Singh said during investigations it was found that Paramjit Singh, was not involved in the murder. He said the three accused had been remanded in judicial custody when they were presented before the Chief Judicial Magistrate Mr G.K. Dhir. A case under Sections 302, 120-B and 34 of the IPC was registered on January 28. FEROZEPORE: Residents of Shanti Nagar, a locality here, have been facing many hardships due to lack of basic civic amenities, including water supply and sewerage. The Municipal Council is helpless to do anything in this regard as it is short of funds. There are nearly 450 built houses and about a similar number of plots lying vacant at Shanti Nagar which has an estimated population of over 2,000. A majority of the residents either belong to the BCs or the SCs. The council has declared the locality a slum area. In absence of tap water, residents have to fetch water from handpumps. Residents allege that the ground water is not fit for drinking and other purposes including cooking. The water is discoloured and unhygienic. As a result, a majority of residents suffer from stomach ailments. To flush out the filth, some residents have constructed septic tanks outside their houses. Others drain out the dirty water with help of PVC pipes. Ms Ranjit Kaur, who resides in a house situated on the edge of the pond, says the dirty water accumulated in the pond has made life hell for them. It gives a foul smell which is intolerable especially during the summer. "The pond is also a nursery for mosquitoes", she adds. Most of the streets are kutcha. As a result, it is very tough for pedestrians to walk on muddy streets during rainy days when streets become slippery. There is the facility of streetlights. But it is not available in all lanes. Even power supply to the available streetlights often remain on and off. Residents of nearly 30 houses live in danger as the 33 kv high tension wire passes over the roofs of their houses. Mr Madan Lal Sharma, an affected resident, says that he is unable to construct the first floor of his house as there is about 15 feet space between the high tension wire and roof of ground floor of his house. The wire passes over the roof of BSM High School in the locality. The school principal, Mr Ravinder Kumar Sharma, says that he himself and several residents of the locality many a time have requested authorities to remove the HT wire. But the things remain the same. They also met certain local politicians but in vain. Residents of the locality are sore over the attitude of authorities of the municipality towards them. Mr Gurdev Raj, who built up his house on a 17-marla plot in 1994, says at the time of sanction of structure plan of his house from the municipality, he deposited development charges of Rs 5,000 to it. He adds saying that he and some other residents have installed their own tubewells to fetch water. "I spent Rs 20,000 on installing a tubewell 200 feet deep in the earth. Besides, I spent Rs 7,000 on the construction of a septic tank", he said adding, the municipality is liable to provide us basic amenities when it gets development charges for the same. When contacted, the municipal council president, Mr Dharam Singh Aulakh told The Tribune that there was a paucity of funds with the council and added, we know how we manage funds for making payment of salaries to the staff. It was not yet possible to provide water supply and sewerage to Shanti Nagar as these schemes require heavy funds. A cultural festival will be organised on the occasion. A public rally will be held to which all major political leaders have been invited. Former Union Minister Arjun Singh is among those expected to attend. According to Mr Jagdev Singh Jassowal, a Punjab Congress leader who served as political secretary to Justice Gurnam Singh, Mr Gurbir Singh, son of the late Chief Minister, was also present during an interaction with newspersons here today. Justice Gurnam Singh was born in a prominent family of Ludhiana district on February 25, 1899. He graduated from Forman Christian College, Lahore, and was called to the Bar from the Middle Temple, London. Justice Gurnam Singh started practice in Lyallpur (now Faisalabad) in Pakistan and became the president of the Bar Association. He was recognised as one of the leading criminal lawyers in pre-Partition Punjab. After Partition, he was elevated to the Bench in 1950, serving as judge of the PEPSU and Punjab High Courts and retired in 1959. He was an ardent nationalist who joined politics after retirement from the Bench on the invitation of C. Rajagopalachari and Master Tara Singh. His advent into politics marked the beginning of an era which transformed Sikh polity and made a distinct impact on national politics. The troika of Master Tara Singh, Sant Fateh Singh and Justice Gurnam Singh revived the Akali party which had been dissolved following the Nehru-Tara Singh pact in 1955. Justice Gurnam Singh was elected to the Punjab Legislative Assembly in 1962 on the Akali Dal ticket and was Leader of the Opposition from 1962 to 1967. After the formation of the linguistic or unilingual state of Punjab in 1966, he became the first non-Congress Chief Minister of the state in 1967, heading an Akali Dal-led United Front government which included the Communists, the Jan Sangh, the Socialist and Republican Parties. In 1969, he became Chief Minister for the second time. CHANDIGARH, Feb 10  Teachers and other staff from state-aided schools of Punjab launched a statewide satyagraha to highlight the indifferent attitude of the Punjab Government towards their long pending demands. A rally was staged in this connection by employees from Ludhiana in Sector 17 here today. The employees, including a large number of women, from various parts of the district assembled near the bus stand and marched towards the housing board roundabout, raising slogans. Many of the protesters were carrying black flags and placards. Mr Teja Singh and Mr M.L. Chopra, President and General Secretary, respectively, of the Punjab State Aided School Teachers and Other Employees Union, said the government had failed to notify the recommendations of the Fourth Pay Commission. They alleged that the pensionary benefits of more than 500 persons had also been denied despite an agreement between the Punjab Finance Minister and the representatives of the union in August last year. Mr Teja Singh said the union had decided to go ahead with the boycott of middle standard exams beginning on February 16. Members from Patiala, Ropar, Sangrur and Fatehgarh Sahib will stage a dharna in the city, besides courting arrest, tomorrow, he added. AMRITSAR, Feb 10  The Department of Mathematics of Guru Nanak Dev University here will organise the third annual conference on information theory and applications and a national symposium on management science and statistics  applications to trade and industry from February 12 to 14. Dr Om Parkash, organising secretary and Director of conference, said here today Prof K.K. Aggarwal, Vice-Chancellor Indraprastha Vishwa vidyalaya, New Delhi, will inaugurate the conference. Prof J.N. Kapur, former Vice-Chancellor of Meerut University and President of the Indian Society of Information Theory and Applications will deliver the keynote address at the Guru Nanak Bhavan auditorium of the university. He said more than 100 scientists from all over the country will take part in this three-day conference. More than 80 research papers will be presented by eminent scientists on this occasion. According to sources in the Department of Excise and Taxation in order to tackle the financial crunch and reduce the budget deficit for 1999-2000, the government has decided to revive sales tax barriers. The barriers will be installed at vulnerable points only, instead of all 24 points which were earlier scrapped by the government. Sales tax officials had started laying nakas to check tax evasion at entry points, causing resentment among traders. The points at which the sales tax barriers are to be installed include Madhopur, Munak, Shambu, Chakki and Hoshiarpur. The sources said these barriers were likely to come into force from April and a notification to this effect was likely to be issued in March. NANGAL, Feb 10  The Punjab and Haryana High Court today stayed the dismissal of teachers of two schools run by the local Municipal Council. Nineteen teachers of Shivalik Model School and NAC Medium High School were dismissed by the Municipal Council after passing a resolution on February 4, holding their appointment to be illegal. Earlier today, the school authorities tried to start teaching work in the school, which had been closed for the past two days, by hiring the services of private teachers. However, the dismissed teachers, who had staged a dharna in front of the school, entered the school and started raising slogans against the administration. The school was then closed by orders given by ADC, Anandpur, Mr Tejvir Singh. The teachers have decided to lift the dharna only after joining duty tomorrow. BATHINDA, Feb 10  The Punjab Pradesh Beopar Mandal has expressed apprehension that the Punjab Government was trying to introduce coercive measures to collect sales tax from traders in the state. In a press note issued here today, Mr Madan Lal Kapoor and Mr Banarasi Dass Goyal, president and general secretary respectively of the mandal, said that the state government was planning to establish sales tax barriers in the state. They alleged that before coming to power, the ruling parties had promised the traders to simplify the sales tax structure but now they were going to harass the traders by establishing the barriers. They demanded that the draft of the proposal of establishing sales tax barriers should be circulated to the traders and discussion should be held on it before its implementation.